Public interest is not part of the equation and has no place in the fabric of a society run by corporate welfare. “Less government” is a simple phrase which can be perceived at differing levels of intellect. The least sophisticated is still able to use it on the street, by the water cooler and in church foyers while higher minds can discuss it at think-tank levels of thought. I propose an equally simple but intellectually perceivable phrase that ought to appeal to every self-styled conservative, liberal, libertarian, tea-partier and neocon terrorist. The phrase has important – almost critical current social implications and is ignored at great risk. Corporate welfare has as its unstated but intensely pursued goal a control of the resources (earning power, consuming power and voting power) of the nation. What is desired is that we who make up the backbone of any capitalist system – you know, those who produce and those who consume – are regarded by corporate welfarists as resources to be bound to the economy as historically serf’s were bound to feudal lords. I’m not kidding … in the minds of these blood suckers, we individual citizens better serve a nation based on corporate welfare by becoming nothing more than exploitable assets. We can dress it up all we want but corporations by definitions to not see us as human or as assets worthy of anything more than bare-essentials maintenance. That is the most honest admission you will ever get from any bottom line outfit whose “compassion” consists of trying to guess what “need” may be exploited in this moment to go buy something. Corporate welfare is all about privatizing the entirety of government functions and the related funds into a dictatorship of monopoly over every aspect of economic well being from consumption to protection of well-being. 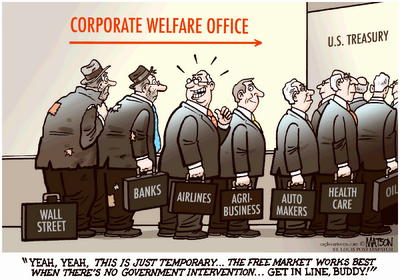 Corporate welfare is about making our government its agent of power. Public interest is not part of the equation and has no place in the fabric of a society run by corporate welfare. The values within such a society are to be business objectives, ambition, profit, fortune and a re-definition of what constitutes private property. This is the genuine socialism of which amateur conservatives should be terrified. To those willing to see truth as truth, our vast global military enterprise that expands corporate welfare at the point of a gun is in fact just that: Military Enterprise as opposed to military self-defense and a concern for world peace or even the old ideals of stopping communism and all the other “isms” that kept American mothers up at night worried about their children. Corporate welfare pretends that our military enterprise has nothing to do with wars over energy, the control of which is much more about profits than national security. Democracies established at the point of American guns have not been nor will they ever be governments of the people, rather they will be governments of inevitable imported corporate welfare. They will be “democracies” that better, by God, know who runs things around here. American foreign policy makers have used the word “democracy” when what they really mean and what we can see wherever we look are nothing but corporate welfare client states. Our 20th and 21st century foreign policies have been nothing more than helping establish and then using money to keep in place governments whose job is to make their land safe for corporate welfare. If you dispute that, then please define for me the humanistic and altruistic objectives of the World Bank and the International Monetary Fund whose tactics are textbook corporate welfare? Think Argentina, Brazil and Mexico. Think about the investors who bought up the debts incurred by poor countries that faced a default of World Bank and IMF loans, then demanded immediate payment, took the countries to court and threw each one further into a feudal relationship with the rest of the world. I have used the phrase “U.S. Imperialism” and for the most part have generated no genuine understanding or empathy for that concept. Rather, it has usually been seen as a disrespectful or un-patriotic “attack on America” which offends even many American moderates. This perhaps because we do not recognize our unreasonable “heroic” view of America and its global white hat that were all taught to worship … and to which insincere politicians of every ilk frequently appeal as a cry to conformity . The word “imperial” used in a foreign policy context, because it implies military action or gun-point diplomacy, is the wrong buzz word to anger genuinely critical-thinking Americans. Its immediate generation of an image of villains doesn’t work. What about corporate welfare using imperialistic tactics to achieve economic conquest? How do those words work for you? Subjugation of foreign populations for the benefit of corporate welfare doesn’t ring any bells here? Viet Nam, the Iran of the Shah, Chile, Nicaragua, to name a few examples … do you think the corporate welfare foreign policies had those outcomes in mind. Do you think Hugo Chavez is a villain for any genuine reason other than corporate welfare priorities? Our American government dominated by lobbied dollar bills and subverted by corporate welfare objectives did those things, and lied to you and me about the reasons we did what we did. Corporate welfare is definitely not “American” and had not even a pseudo-legitimacy until the extremely foolish act of legalizing “personhood” status to an individual “person” capable of outspending 99.999 % of human citizen persons in this country. Corporate welfare is in fact a radical departure from the values and constitutional ideas upon which the country was founded and the intent by which we were to be governed. Using dollar bills, corporations have seized control of the government in a coup that began long ago and the realization of which remains a minority awareness in this country dominated by dumbed-down and censored public communication of news, opinion and actual information. The real traitors in this country are not liberals or socialists. They are the corporate welfare leeches who lie and mislead the people into accepting business interests as what’s best for our citizens. The real patriots are not this who buy up weapons and play at militia campouts on weekends or who strut around packing big irons on their hips. Real patriots expose corporate welfare and do not hesitate to point out when a lie is a lie. Real patriots recognize prostitution of the media precisely for what it is. Real patriots are at least willing to look elsewhere than major broadcast sources for genuine truth and fact-based reports. Real patriots think about their country without wandering down the globalization path on which they and their fellow citizens finance corporate welfare mostly by mindless and uncritical consumption. Real patriots know what the hell they are talking about when they advocate restoring democracy and pointing almost all fingers at corporate welfare as a cause for the loss. This entry was posted in American Values, corporate welfare and tagged corporation, welfare by Arthur Ruger. Bookmark the permalink.